Once upon a fairy tale…..September 25 , 2010 my husband and I attended the wedding of our dear friend Adam Ryan and his bride, Brooke Anderson. I am such a sucker for weddings. I love everything about them from the decor to the excitement in the air. The weather was picture perfect for the outside ceremony; blue skies and a gentle breeze. As we arrived at the home of Mark and Shannon Farrington, the gracious and sweet couple who hosted the wedding at their lovely home, I was already in awe of my surroundings. Chandeliers hanging from the trees by thick satin sapphire blue ribbons, candles floating in the pool, white lights twinkling in every tree creating an atmosphere of intoxicating beauty, and when dusk fell, the already beautiful grounds were transformed into a romantic, candlelight, scene that would have fit nicely into any fairy tale storybook. The entire wedding just shouted elegance. The bridesmaids, in sapphire chiffon floor length gowns, looked beyond graceful and beautiful. Hidden under each gown where some incredibly sassy ankle boots that gave personality and a fun twist to the formal occasion. The Groomsmen looked dashing in their fitted suits and sapphire ties. A very gentleman-like appearance that was the perfect complement to the lovely bridesmaids. The Groom, Mr. Adam Ryan in true prince charming style, couldn't stop grinning as his fairy tale day was unfolding, and the time was growing closer for his bride to take her stroll down the aisle. I always love the look on the groom's face when he gets that first glance at his bride as she glides down the aisle towards him with a backdrop of family and friends to celebrate and bear witness to the special occasion. At seven o’ clock pm, Ms. Brooke Anderson began that stroll under a perfect night sky down the candle lined aisle. 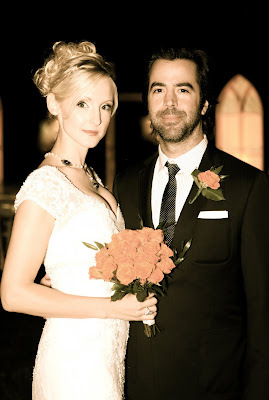 The bride was an angelic vision in her lace, fitted, vintage-style gown and floor length veil. She accessorized with pearls and sapphires around her neck and, like the bridesmaids, she added a little fun twist with her sapphire blue peep-toed heels. Her hair was pinned up with gentle curls draping over her veil a single, tiny side swept braid perfectly placed about her brow. She was truly an enchantingly beautiful bride. 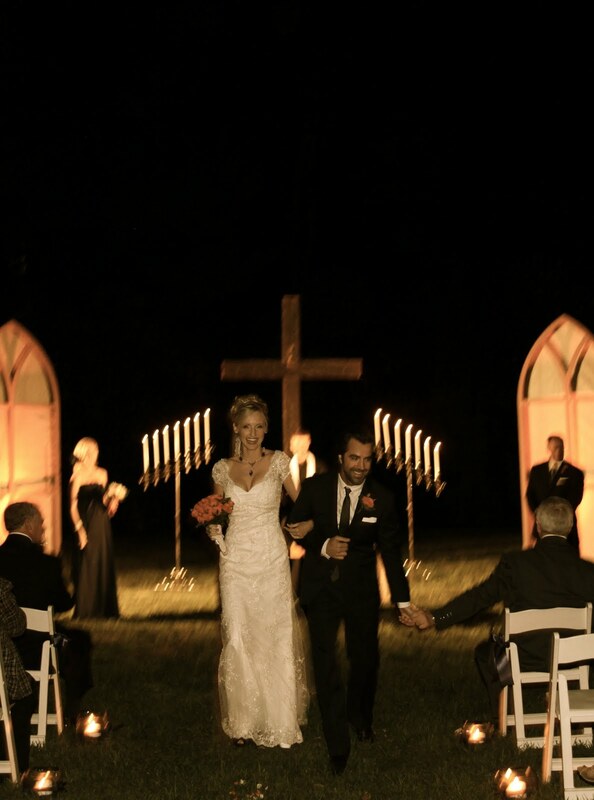 The Ceremony was just as perfect as the atmosphere. The wedding attire and all the special touches placed in the little details made this day extra memorable. One of my favorite details was the rugged cross at the center of the decorations. The cross was a beautiful symbol of the couples deep commitment to Christ and the necessity for God to be at the center of their marriage. Also making the day unique was the pastor conducting the ceremony(his first), Brooke’s older brother, Ben Anderson. 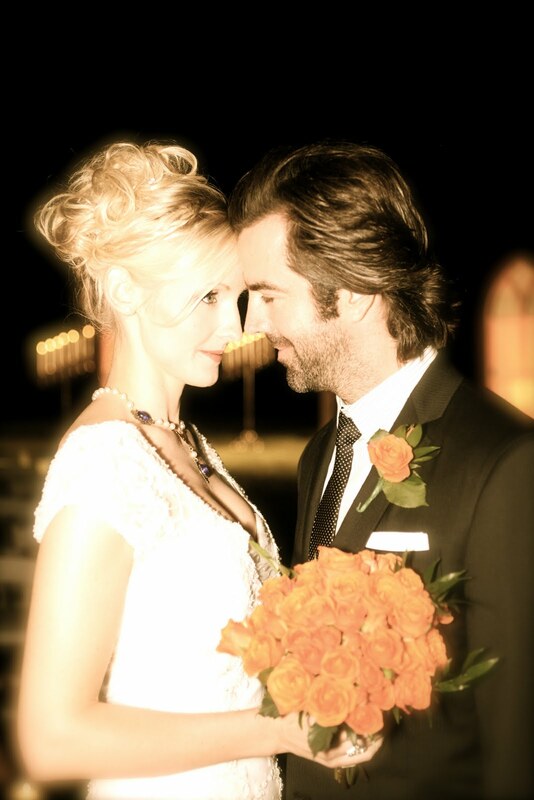 You could just hear the love and excitement in his voice as he walked Adam and Brooke through the ceremony. I love it when a bride and groom choose to write their own vow. It just seems to make the ceremony extra beautiful when a couple expresses their love and commitment to one another in their own words. This is just what they did making the spoken section of the ceremony a significant, personal and heartfelt portion of Brooke and Adam’s union. 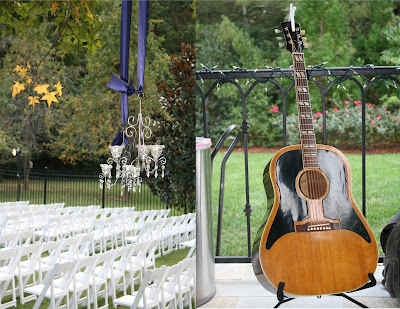 Additional details involved a tiny little dancer, a musician with Adam’s guitar in hand, music written by the groom. Every aspect of this fairy tale event worked magically together in perfect harmony creating a radiant day in which Adam & Brooke united into matrimony beginning their journey through life and love together as one. Becoming authors of their very own fairy tale…wishing them both a very Happily Ever After….